Ten years ago the Public Library of Science started one big lower impact and a series of smaller higher impact journals. Over the years these publication outlets diverged. The growing divide between standard and top journals might mirror wider trends in scholarly publishing. There are roughly two kinds of journals in the Public Library of Science (PLoS): low impact (IF = 3.06) and higher impact (3.9 < IF < 13.59) journals. There is only one low impact journal, PLoS ONE, which is bigger in terms of output than all the other journals in PLoS combined. Its editorial policy is fundamentally different to the higher impact journals in that it does not require novelty or ‘strong results’. All it requires is methodological soundness. Comparing PLoS ONE to the other PLoS journals then offers the opportunity to plot the growing divide between ‘high impact’ and ‘standard’ research papers. I will follow the hypothesis that more and more information is required for a publication (Vale, 2015). More information could be mirrored in three values: the number of references, authors, or pages. And indeed, the higher impact PLoS journal articles have longer and longer reference sections, a rise of 24% from 46 to 57 over the last ten years (Pearson r = .11, Spearman rho = .11), see also my previous blog post for a similar pattern in another high impact journal outside of PLoS. The lower impact PLoS ONE journal articles, on the other hand, practically did not change in the same period (Pearson r = .01, Spearman rho = -.00). The diverging pattern between higher and low impact journals can also be observed with the number of authors per article. While in 2006 the average article in a higher impact PLoS journal was authored by 4.7 people, the average article in 2016 was written by 7.8 authors, a steep rise of 68% (Pearson r = .12, Spearman rho = .19). And again, the low impact PLoS ONE articles do not exhibit the same change, remaining more or less unchanged (Pearson r = .01, Spearman rho = .02). Finally, the number of pages per article tells the same story of runaway information density in higher impact journals and little to no change in PLoS ONE. Limiting myself to articles published until late november 2014(when lay-out changes complicate the comparison), the average higher impact journal article grew substantially in higher impact journals (Pearson r = .16, Spearman rho = .13) but not in PLoS ONE (Pearson r = .03, Spearman rho = .02). So, overall, it is true that more and more information is required for a publication in a high impact journal. No similar rise in information density is seen in PLoS ONE. The publication landscape has changed. More effort is now needed for a high impact publication compared to ten years ago. PLoS ONE started 11 years ago to disruptively change scholarly publishing. By now it is the biggest scientific journal out there. Why has it become so slow? Many things changed at PLoS ONE over the years, reflecting general trends in how researchers publish their work. For one thing, PLoS ONE grew enourmously. After publishing only 137 articles in its first year, the number of articles published per year peaked in 2013 at 31,522. However, as shown in the figure above, since then they have declined by nearly a third. In 2016 only 21,655 articles were published in PLoS ONE. The decline could be due to a novel open data policy implemented in March 2014, a slight increase in the cost to publish in October 2015, or a generally more crowded market place for open access mega journals like PloS ONE (Wakeling et al., 2016). However, it might also be that authors are becoming annoyed with PLoS ONE for getting slower. In its first year, it took 95 days on average to get an article from submission to publication in PLoS ONE. In 2016 it took a full 172 days. This renders PLoS ONE no longer the fastest journal published by PLoS, a title it held for nine years. The graph below shows the developemtn of PLoS ONE in more detail by plotting each article’s review and publication speed against its publication date, i.e. each blue dot represents one of the 159,000 PLoS ONE articles. What can explain the increasingly poor publication speed of PLoS ONE? Most people might think it is the sheer volume of manuscripts the journal has to process. Processing more articles might simply slow a journal down. However, this slow down continued until 2015, i.e. beyond the peak in publication output in 2013. Below, I show a more thorough analysis which reiterates this point. The plot shows each article in PLoS ONE in terms of its time from submission to publication and the number of articles published around the same time (30 days before and after). There is a link, for sure (Pearson r = .13, Spearman rho = .15), but it is much weaker than I would have thought. Moreover, when controlling for publication date via a partial correlation, the pattern above becomes much weaker (partial Pearson r = .05, partial Spearman rho = .11). This suggests that much of PLoS ONE’s slow down is simply due to the passage of time. Perhaps, during this time scientific articles changed, requiring a longer time to evaluate whether they are suitable for the journal. For example, it might be that articles these days include more information which takes longer to be assessed by scientific peers. More information could be mirrored in three values: the number of authors (information contributors), the reference count (information links), the page count (space for information). However, the number of authors per article has not changed over the years (Pearson r = .01, Spearman rho = .02). Similarly, there is no increase in the length of the reference sections over the years (r = .01; rho = -.00). Finally, while articles have indeed become longer in terms of page count (see graph below), the change is probably just due to a new lay-out in January 2015. Perhaps, it takes longer to go through peer-review at PLoS ONE these days because modern articles are increasingly complex and interdisciplinary. A very small but reliable correlation between subject categories per article and publication date supports this possibility somewhat, see below. It is possible that PLoS ONE simply finds it increasingly difficult to look for the right experts to assess the scientific validity of an article because articles have become more difficult to pin down in terms of the expertise they require. Having celebrated its 10 year anniversary, PLoS ONE can be proud to have revolutionized scholarly publishing. However, whether PLoS ONE itself will survive in the new publishing environment it helped to create remains to be seen. The slowing down of its publication process is certainly a sign that PLoS ONE needs to up its game in order to remain competitive. Nature Reviews Neuroscience is one of the foremost journals in neuroscience. What do its articles look like? How have they developed? This blog post provides answers which might guide you in writing your own reviews. Reviews in Nature Reviews Neuroscience cover more and more ground. Ten years ago, 93 references were the norm. Now, reviews average 150 references. This might be an example of scientific reports in general having to contain more and more information so as not to be labelled ‘premature’, ‘incomplete’, or ‘insufficient’ (Vale, 2015). Reviews in NRN include more and more references. Nature Reviews Neuroscience is not the outlet for your history of neuroscience review. Only 22% of cited articles are more than 10 years old. A full 17% of cited articles were published a mere two years prior to the review being published, i.e. something like one year before the first draft of the review reached Nature Reviews Neuroscience (assuming a fast review process of 1 year). Focus on recent findings. Ignore historical contexts. If at all, give a historical background early on in your review. References are given in order of first presentation in Nature Reviews Neuroscience. Dividing this order in quarters allows us to reveal the age distribution of references in the quarter of the review where they are first mentioned. As can be seen in the figure below, the pressure for recency is less severe in the first quarter of your review. It increases thereafter. So, if you want to take a risk and provide a historical context to your review, do so early on. The change in reference age distributions of the different quarters of reviews is not easily visible. Therefore, I fit a logarithmic model to the distributions (notice dotted line in Figure above) and used its parameter estimates as a representation of how ‘historical’ references are. Of course, the average reference is not historical, hence the negative values. But notice how the parameter estimates become more negative in progressive quarters of the reviews: history belongs at the beginning of a review. Ignore historical contexts, especially later in your review: the modeling outcome. Now, find a topic and write that Nature Review Neuroscience review. What are you waiting for? New York Magazine has published a great article about how grad student Steven Ludeke tried to correct mistakes in the research of Pete Hatemi and Brad Verhulst. Overall, Ludeke summarises his experience as ‘not recommendable’. Back in my undergraduate years I spotted an error in an article by David DeMatteo and did little to correct it. Why? Christian Bale playing a non-incarcerated American Psycho. David DeMatteo, assistant professor in Psychology at Drexel University, investigates psychopathy. In 2010, I was a lowly undergraduate student and noticed a glaring mistake in one of his top ten publications which has now been cited 50 times according to Google Scholar. The glaring mistake in this publication is that Factor 2 scores at 7.1 (the behavioural features of psychopathy) are actually higher than the Factor 1 scores at 5.2 (the personality features of psychopathy). The numbers tell the exactly opposite story to the words. The error in short. The numbers obviously do not match up with the statement. The numbers are given twice in the paper making a typo unlikely (p. 138 and p. 139). Adjusting the scores for the maxima of the scales that they are from (factor 1 x/x_max = 0.325 < factor 2 x/x_max=0.394) or the sample maximum (factor 1 x/x_max_obtained = 0.433 < factor 2 x/x_max_obtained = 0.44375) makes no difference. No outlier rejection is mentioned in the paper. In sum, it appears as if DeMatteo and his co-authors interpret their numbers in a way which makes intuitive sense but which is in direct contradiction to their own data. When researchers disagree with their own data, we have a real problem. 1) Self doubt. I consulted with my professor (the late Paddy O’Donnel) who confirmed the glaring mistake. 2) Contact the author. I contacted DeMatteo in 2010 but his e-mail response was evasive and did nothing to resolve the issue. I have contacted him again, inviting him to react to this post. 3) Check others’ reactions. I found three publications which cited DeMatteo et al.’s article (Rucevic, 2010; Gao & Raine, 2010; Ullrich et al., 2008) and simply ignored the contradictory numbers. They went with the story that community dwelling psychopaths show psychopathic personalities more than psychopathic behaviours, even though the data in the article favours the exactly opposite conclusion. 4) Realising my predicament. At this point I realised my options. Either I pursued this full force while finishing a degree and, afterwards, moving on to my Master’s in a different country. Or I let it go. I had a suspicion which Ludeke’s story in New York Magazine confirmed: in these situations one has much to lose and little to gain. Pursuing a mistake in the research literature is ‘clearly a bad choice’ according to Ludeke. And now this blog post detailing my experience. Why? Well, on the one hand, I have very little to lose from a disagreement with DeMatteo as I certainly don’t want a career in law psychology research and perhaps not even in research in general. The balance went from ‘little to gain, much to lose’ to ‘little to gain, little to lose’. On the other hand, following my recent blog posts and article (Kunert, 2016) about the replication crisis in Psychology, I have come to the conclusion that science cynicism is not the way forward. So, I finally went fully transparent. I am not particularly happy with how I handled this whole affair. I have zero documentation of my contact with DeMatteo. So, expect his word to stand against mine soon. I also feel I should have taken a risk earlier in exposing this. But then, I used to be passionate about science and wanted a career in it. I didn’t want to make enemies before I had even started my Master’s degree. In short, only once I stopped caring about my career in science did I find the space to care about science itself. Update 16/11/2016: corrected numerical typo in sentence beginning ‘Adjusting the scores for the maxima…’ pointed out to me by Tom Foulsham via twitter (@TomFoulsh). Academic conferences have been the biggest joy of my PhD and so I want to share with others how to excel at this academic tradition. The author (second from right, with can) at his first music cognition conference (SMPC 2013 in Toronto) which – despite appearances – he attended by himself. A conference is not all about getting to know facts. It’s all about getting to know people. Go to a conference where you feel you can approach people. Attend every single preparatory excursion/workshop/symposium, every social event, every networking lunch. Sit at a table where you know no-one at all. Talk to the person next to you in every queue. At first, you will have only tiny chats. Later, these first contacts can develop over lunch. Still later you publish a paper together (Kunert & Slevc, 2015). The peer-review process might make you think that academics are awful know-it-alls. At a conference you will discover that they are actually interesting, intelligent and sociable people. Meet them! The conference bar is a mythical place where researchers talk about their actual findings, their actual doubts, their actual thoughts. If you want to get rid of the nagging feeling that you are an academic failure, talk to researchers at a conference. You will see that the published literature is a very polished version of what is really going on in research groups. It will help you put your own findings into perspective. You can get even more out of a conference if you let go of your fear of being scooped and answer other people’s honesty with being open about what you do. I personally felt somewhat isolated with my research project at my institute. Conferences were more or less the only place to meet people with shared academic interests. Being open there didn’t just improve the bond with other academics, it led to concrete improvements of my research (Kunert et al., 2016). Get out of the conference hotel and explore the city. More often than not conferences are held in suspiciously nice places. Come a few days early, get rid of your jet-lag while exploring the local sights. Stay a few days longer and gather your thoughts before heading back to normal life. You might never again have an excuse to go to so many nice places so easily. The most important answer is yes. You might get asked for all sorts of things to do during the conference. Just say yes. I attended the Gran’ Ol Opry in Nashville. I found myself in a jacuzzi in Redwood, CA. I attended a transvestite bar in Toronto. All with people I barely knew. All with little to no information on what the invitation entailed. Just say yes and see what happens. It might sound terribly intimidating to go to an academic conference if you just started your PhD. In this case a national or student only conference might be a good first step into the academic conference tradition. Conferences are the absolute highlight of academia. Don’t miss out on them. Psychological science is surprisingly difficult to replicate (Open Science Collaboration, 2015). Researchers are desperate to find out why. A new study in the prestigious journal PNAS (Van Bavel et al., 2016) claims that unknown contextual factors of psychological phenomena (“hidden moderators”) are to blame. The more an effect is sensitive to unknown contextual factors, the less likely a successful replication is. In this blog post I will lay out why I am not convinced by this argument. a) replication effect sizes are mostly lower than original effect sizes. Effects might well “vary by [replication] context” (p. 2) but why the consistent reduction in effect size when replicating an effect? b) internal conceptual replications are not related to independent replication success (Kunert, 2016). This goes directly against Van Bavel et al.’s (2016) suggestion that “conceptual replications can even improve the probability of successful replications” (p. 5). c) why are most original effects just barely statistically significant (see previous blog post)? I believe that all three patterns point to some combination of questionable research practices affecting the original studies. Nothing in Van Bavel et al.’s (2016) article manages to convince me otherwise. Moreover, another measure of replication success (reduction of effect size between original and replication study) is so weakly correlated with the contextual sensitivity variable (r = -.01) as to provide strong evidence for a lack of association between contextual sensitivity and replication success (BF01 = 12, notice that even the direction of the correlation is in the wrong direction according to Van Bavel et al.’s (2016) account). How do we know which original effects were plagued by hidden moderators (i.e. by unknown context sensitivity) if, well, these moderators are hidden? Three of the authors of the article simply rated all replicated studies for contextual sensitivity without knowing each study’s replication status (but after the replication success of each study was known in general). The authors provide evidence for the ratings to be reliable but no one knows whether they are valid. For example, the raters tried not to be influenced by ‘whether the specific replication attempt in question would succeed’ (p. 2). Still, all raters knew they would benefit (in the form of a prestigious publication) from a significant association between their ratings and replication success. How do we know that the ratings do not simply reflect some sort of implicit replicability doubt? From another PNAS study (Dreber et al., 2015) we know that scientists can predict replication success before a replication study is run. My problem with the contextual sensitivity account claiming that unknown moderators are to blame for replication failures is not so much that it is an unlikely explanation. I agree with Van Bavel et al. (2016) that some psychological phenomena are more sensitive to replication contexts than others. I would equally welcome it if scientific authors were more cautious in generalising their results. My problem is that this account is so general as to be nearly unfalsifiable, and an unfalsifiable account is scientifically useless. Somehow unknown moderators always get invoked once a replication attempt has failed. All sorts of wild claims could be retrospectively claimed to be true within the context of the original finding. In short: a convincing claim that contextual factors are to blame for replication failures needs to reveal the crucial replication contexts and then show that they indeed influence replication success. The proof of the unknown pudding is in the eating. #As far as I know there is currently no Bayesian Spearman rank correlation analysis. Therefore, use standard correlation analysis with raw and ranked data and hope that the result is similar. The replicability of psychological research is surprisingly low. Why? In this blog post I present new evidence showing that questionable research practices contributed to failures to replicate psychological effects. Quick recap. A recent publication in Science claims that only around 40% of psychological findings are replicable, based on 100 replication attempts in the Reproducibility Project Psychology (Open Science Collaboration, 2015). A few months later, a critical commentary in the same journal made all sorts of claims, including that the surprisingly low 40% replication success rate is due to replications having been unfaithful to the original studies’ methods (Gilbert et al., 2016). A little while later, I published an article in Psychonomic Bulletin & Review re-analysing the data by the 100 replication teams (Kunert, 2016). I found evidence for questionable research practices being at the heart of failures to replicate, rather than the unfaithfulness of replications to original methods. However, my previous re-analysis depended on replication teams having done good work. In this blog post I will show that even when just looking at the original studies in the Reproducibility Project: Psychology one cannot fail to notice that questionable research practices were employed by the original discoverers of the effects which often failed to replicate. The reanalysis I will present here is based on the caliper test introduced by Gerber and colleagues (Gerber & Malhotra, 2008; Gerber et al., 2010). The idea of the caliper test is simple. The research community has decided that an entirely arbitrary threshold of p = 0.05 distinguishes between effects which might just be due to chance (p > 0.05) and effects which are more likely due to something other than chance (p < 0.05). If researchers want to game the system they slightly rig their methods and analyses to push their p-values just below the arbitrary border between ‘statistical fluke’ and ‘interesting effect’. Alternatively, they just don’t publish anything which came up p > 0.05. Such behaviour should lead to an unlikely amount of p-values just below 0.05 compared to just above 0.05. The figure below shows the data of the Reproducibility Project: Psychology. On the horizontal axis I plot z-values which are related to p-values. The higher the z-value the lower the p-value. On the vertical axis I just show how many z-values I found in each range. The dashed vertical line is the arbitrary threshold between p < .05 (significant effects on the right) and p > .05 (non-significant effects on the left). The independent replications in blue show many z-values left of the dashed line, i.e. replication attempts which were unsuccessful. Otherwise the blue distribution is relatively smooth. There is certainly nothing fishy going on around the arbitrary p = 0.05 threshold. The blue curve looks very much like what I would expect psychological research to be if questionable research practices did not exist. However, the story is completely different for the green distribution representing the original effects. Just right of the arbitrary p = 0.05 threshold there is a surprising clustering of z-values. It’s as if the human mind magically leads to effects which are just about significant rather than just about not significant. This bump immediately to the right of the dashed line is a clear sign that original authors used questionable research practices. This behaviour renders psychological research unreplicable. For the expert reader, the formal analysis of the caliper test is shown in the table below using both a Bayesian analysis and a classical frequentist analysis. The conclusion is clear. There is no strong evidence for replication studies failing the caliper test, indicating that questionable research practices were probably not employed. The original studies do not pass the caliper test, indicating that questionable research practices were employed. 1Based on 100,000 draws from the posterior distribution of log odds. As far as I know, this is the first analysis showing that data from the original studies of the Reproducibility Project: Psychology point to questionable research practices [I have since been made aware of others, see this comment below]. Instead of sloppy science on the part of independent replication teams, this analysis rather points to original investigators employing questionable research practices. This alone could explain the surprisingly low replication rates in psychology. Psychology failing the caliper test is by no means a new insight. Huge text-mining analyses have shown that psychology as a whole tends to fail the caliper test (Kühberger et al., 2013, Head et al., 2015). The analysis I have presented here links this result to replicability. If a research field employs questionable research practices (as indicated by the caliper test) then it can no longer claim to deliver insights which stand the replication test (as indicated by the Reproducibility Project: Psychology). It is time to get rid of questionable research practices. There are enough ideas for how to do so (e.g., Asendorpf et al., 2013; Ioannidis, Munafò, Fusar-Poli, Nosek, & Lakens, 2014). The Reproducibility Project: Psychology shows why there is no time to waste: it is currently very difficult to distinguish an interesting psychological effect from a statistical fluke. I doubt that this state of affairs is what psychological researchers get paid for. PS: full R-code for recreating all analyses and figures is posted below. If you find mistakes please let me know. PPS: I am indebted to Jelte Wicherts for pointing me to this analysis. I adjusted text to clarify that caliper test cannot distinguish between many different questionable research practices, following tweet by Daniël Lakens. I toned down the language somewhat following tweet by Daniel Bennett. I added reference to Uli Schimmack’s analysis by linking his comment. #caliper test according to Gerber et al. #How many draws are to be taken from posterior distribution for BF and Credible Interval calculations? The more samples the more precise the estimate and the slower the calculation. Are internal replications the solution to the replication crisis in Psychology? No. Most Psychology findings are not replicable. What can be done? Stanford psychologist Michael Frank has an idea : Cumulative study sets with internal replication. ‘If I had to advocate for a single change to practice, this would be it.’ I took a look whether this makes any difference. A recent paper in the journal Science has tried to replicate 97 statistically significant effects (Open Science Collaboration, 2015). In only 35 cases this was successful. Most findings were suddenly a lot weaker upon replication. This has led to a lot of soul searching among psychologists. Fortunately, the authors of the Science paper have made their data freely available. So, soul searching can be accompanied by trying out different ideas for improvements. What can be done to solve Psychology’s replication crisis? If I had to advocate for a single change to practice, this would be it. In my lab we never do just one study on a topic, unless there are major constraints of cost or scale that prohibit that second study. Because one study is never decisive. * Build your argument cumulatively, using the same paradigm, and include replications of the key effect along with negative controls. […] If you show me a one-off study and I fail to replicate it in my lab, I will tend to suspect that you got lucky or p-hacked your way to a result. But if you show me a package of studies with four internal replications of an effect, I will believe that you know how to get that effect – and if I don’t get it, I’ll think that I’m doing something wrong. If this argument were true, then the 41 studies which were successfully, conceptually replicated in their own paper should show higher rates of replication than the 56 studies which were not. Of the 41 internally replicated studies, 19 were replicated once, 10 twice, 8 thrice, 4 more than three times. I will treat all of these as equally internally replicated. Are internal replications the solution? No. So, does the data by the reprocucibility project show a difference? I made so-called violin plots, thicker parts represent more data points. In the left plot you see the reduction in effect sizes from a bigger original effect to a smaller replicated effect. The reduction associated with internally replicated effects (left) and effects which were only reported once in a paper (right) is more or less the same. In the right plot you can see the p-value of the replication attempt. The dotted line represents the arbitrary 0.05 threshold used to determine statistical significance. Again, replicators appear to have had as hard a task with effects that were found more than once in a paper as with effects which were only found once. If you do not know how to read these plots, don’t worry. Just focus on this key comparison. 29% of internally replicated effects could also be replicated by an independent team (1 effect was below p = .055 and is not counted here). The equivalent number of not internally replicated effects is 41%. A contingency table Bayes factor test (Gunel & Dickey, 1974) shows that the null hypothesis of no difference is 1.97 times more likely than the alternative. In other words, the 12 %-point replication advantage for non-replicated effects does not provide convincing evidence for an unexpected reversed replication advantage. The 12%-point difference is not due to statistical power. Power was 92% on average in the case of internally replicated and not internally replicated studies. So, the picture doesn’t support internal replications at all. They are hardly the solution to Psychology’s replication problem according to this data set. I believe that internal replications do not prevent many questionable research practices which lead to low replication rates, e.g., sampling until significant and selective effect reporting. To give you just one infamous example which was not part of this data set: in 2011 Daryl Bem showed his precognition effect 8 times. Even with 7 internal replications I still find it unlikely that people can truly feel future events. Instead I suspect that questionable research practices and pure chance are responsible for the results. Needless to say, independent research teams were unsuccessful in replication attempts of Bem’s psi effect (Ritchie et al., 2012; Galak et al., 2012). There are also formal statistical reasons which make papers with many internal replications even less believable than papers without internal replications (Schimmack, 2012). In my previous post I have shown evidence for questionable research practices in this data set. These lead to less replicable results. Pre-registering studies makes questionable research practices a lot harder and science more reproducible. It would be interesting to see data on whether this hunch is true. Why are Psychological findings mostly unreplicable? Take 97 psychological effects from top journals which are claimed to be robust. How many will replicate? Brian Nosek and his huge team tried it out and the results were sobering, to say the least. How did we get here? The data give some clues. Sometimes the title of a paper just sounds incredible. Estimating the reproducibility of psychological science. No one had ever systematically, empirically investigated this for any science. Doing so would require huge resources. The countless authors on this paper which appeared in Science last week went to great lengths to try anyway and their findings are worrying. When they tried to replicate 97 statistically significant effects with 92% power (i.e. a nominal 92% chance of finding the effect should it exist as claimed by the original discoverers), 89 statistically significant effect should pop up. Only 35 did. Why weren’t 54 more studies replicated? The team behind this article also produced 95% Confidence Intervals of the replication study effect sizes. Despite their name, only 83% of them should contain the original effect size (see here why). Only 47% actually did. Why were most effect sizes much smaller in the replication? Focus on the left panel first. The green replication studies show a moderate relation between the effect size they found and their pre-determined sample size. This is to be expected as the replicators wanted to be sure that they had sufficient statistical power to find their effects. Expecting small effects (lower on vertical axis) makes you plan in more participants (further right on horizontal axis). The replicators simply sampled their pre-determined number, and then analysed the data. Apparently, such a practice leads to a moderate correlation between measured effect size and sample size because what the measured effect size will be is uncertain when you start sampling. The red original studies show a stronger relation between the effect size they found and their sample size. They must have done more than just smart a priori power calculations. I believe that they sampled until their effect was statistically significant, going back and forth between sampling and analysing their data. If, by chance, the first few participants showed the desired effect quite strongly, experimenters were happy with overestimating their effect size and stopped early. These would be red data values in the top left of the graph. If, on the other hand, the first few participants gave equivocal results, the experimenters continued for as long as necessary. Notice how this approach links sample size to the effect size measured in the experiment, hence the strong statistical relation. The approach by the replicators links the sample size merely to the expected effect size estimated before the experiment, hence the weaker association with the actually measured effect size. The right panel shows a Bayesian correlation analysis of the data. What you are looking at is the belief in the strength of the correlation, called the posterior distribution. 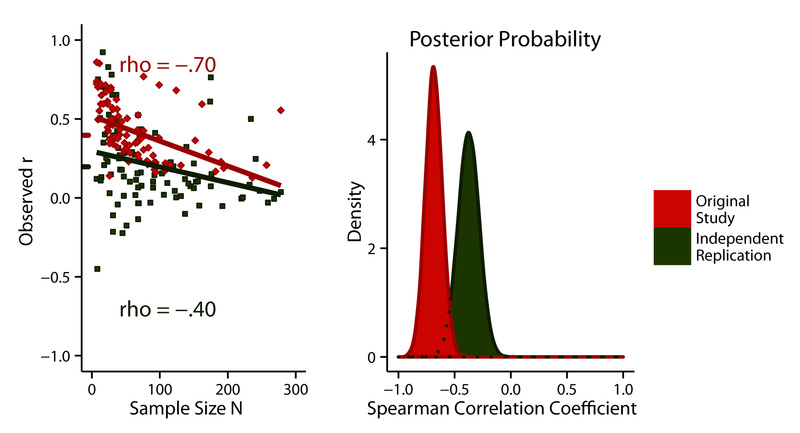 The overlap of the distributions can be used as a measure of believing that the correlations are not different. The overlap is less than 7%. If you are more inclined to believe in frequentist statistics, the associated p-value is .001 (Pearson and Filon’s z = 3.355). Therefore, there is strong evidence that original studies display a stronger negative correlation between sample size and measured effect size than replication studies. The approach which – I believe – has been followed by the original research teams should be accompanied by adjustments of the p-value (see Lakens, 2014 for how to do this). If not, you misrepresent your stats and lower the chances of replication, as shown in simulation studies (Simmons et al., 2011). It is estimated that 70% of psychological researchers have sampled until their result was statistically significant without correcting their results for this (John et al., 2012). This might very well be one of the reasons why replication rates in Psychology are far lower than what they should be. So, one approach to boosting replication rates might be to do what we claim to do anyways and what the replication studies have actually done: aquiring data first, analysing it second. Alternatively, be open about what you did and correct your results appropriately. Otherwise, you might publish nothing more than a fluke finding with no basis.